The Absolute, also represented through other concepts as the Source, Fountain or Well, the Centre, the Monad or One, the All or Whole, the Origin (Arche) or Principle or Primordial Cause, the Sacred or Holy or Utterly Other (Otto), the Form of the Good (Plato), the Mystery, the Ultimate, the Ground or Urground ("Original Ground"), is the concept of an unconditional reality which transcends limited, conditional, everyday existence. The manifestation, creation, of the Absolute has been described as the Logos or Word or World, the Ṛta or Ratio (Latin for "reason"). It is sometimes used as an alternate term for the more commonly used God of the Universe, the Divine or the Supreme Being ("Utmost Being"), especially, but by no means exclusively, to express it in less personal and more impersonal representations. The concept of the Absolute may or may not (depending on one's specific doctrine) possess discrete will, intelligence, awareness, or a personal nature. It is sometimes conceived of as the source through which all being emanates. It contrasts with finite things, considered individually, and known collectively as the relative. This is reflected in the name's Latin etymology absolūtus which means "loosened from" or "unattached" (from a subject-object dualism). The experience of the Absolute or the Holy, or the Mystery (from Greek myein: "to conceal", "to hide", "to hush") of the mystics, is defined by Mircea Eliade as a coincidentia oppositorum (coincidence or solution of all the opposites), that can be furtherly understood as a "state of wholeness" or "nostalgia for the primordial completeness and bliss". Eliade defines the Absolute as the Divine Ground (German: Grund or Urgrund, "Original Ground"), that defiles "all possibilities of rational comprehension" and can only be "grasped as a mystery or paradox". The coincidentia oppositorum, interpreting Nicholas of Cusa, must not be viewed as a synthesis of reason. This is because the Sacred is infinite, while human reason is limited and for it the Sacred remains a mystery. According to Eliade, this "inconceivable transcendental" can only be "expressed by contradictory or paradoxical metaphors". The coincidentia oppositorum can serve to at least approximate the experience of the Mystery or Divine, that does not lend itself to a conceptual formulation, the conjecture of opposites preserving the ambiguous or ineffable content of religious-mystical experience. Rudolf Otto describes the experience of the Holy or the Utterly Other (Ganz Andere) as a mysterium fascinans et tremendum (both fascinating and awful or frightful mystery). It corresponds to Paul Tillich's state of "being grasped by ultimate concern" or Ignatius Loyola and Karl Rahner's "consolation without cause". The Mystery is always mediate; what is immediate in the experience of it is the gift of God's love, consolation in Rahner's terms. There is a meaning of coincidentia oppositorum also in Otto's "fascinating and frightening". In Bernard Lonergan's theory of consciousness the Absolute is explained through the notion of "elemental meaning". This "meaning" of the unmediated Ground is "elemental" in the sense that the distinction between a subject and an object has not yet arisen, there is no object for a subject to apprehend in such an encounter. This elemental meaning can be "set within a conceptual framework", but conceptualisation or objectification never reproduces the original experience. In terms of Lonergan's theory the experience of the Absolute is pre-predicative, precedes the cognitional levels of conceptualised understanding, judgement and decision. It's pre-rational. Subsequent reflection upon the experience allows for an approximate objectification of its content, through symbols. 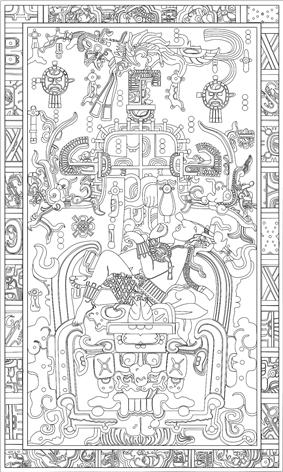 The Maya king Pakal "under-standing" the tree of life. The bird at the top is Itzam-Yeh ("Seven-Macaw"), symbolising the Big Dipper. According to Mircea Eliade, the Sacred, which human beings are not always conscious of in their profane everyday experience, can be mediated or revealed through symbols. For Eliade the "archaic" mind is constantly aware of the presence of the Sacred, and for this mind all symbols are religious (relinking to the Origin). 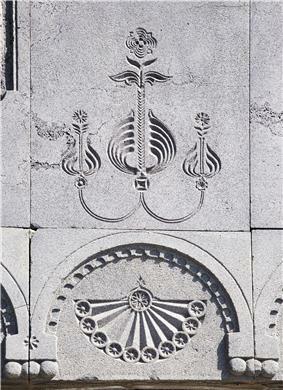 Religious symbols reveal the modality or structuring of the real or world (the manifestation of the Absolute) that is not immediately evident in common experience. Through symbols human beings can get an immediate "intuition" of certain features of the inexhaustible Sacred. The mind makes use of images to grasp the ultimate reality of things because reality manifests itself in contradictory ways and therefore can't be described in concepts. It is therefore the image as such, as a whole bundle of meaning, that is "true" (faithful, trustworthy). The Absolute is expressed through symbols as the Centre and theophanies (modes of manifestation). The world tree or tree of life is a common symbol of the Absolute that generates and sustains the world. The tree is a microcosm, an image of the cosmos (imago mundi), of life, and the mystical bond of every being to the Source. As such it is a symbol of rebirth and resurrection or immortality. «The Divinity revealed in the cosmos in the form of a tree is at the same time a source of regeneration, "life without death", a source to which man turns, for it seems to him to give grounds for his hopes concerning his own immortality». As axis mundi ("axle of the world") the tree represents a repository or receptacle of the Sacred, where one can access to knowledge of the Absolute reality. Attaining the Centre, that is living in the Sacred, that is the main desire of the religious man, is equivalent to a consecration or initiation, that is the passage to a new life that is real, enduring and effective. As axis mundi it is the Centre of the universe, supporting and linking the three levels of its dimension: Heaven, Earth and Hell. As the mystical bond to the Divine, the tree is represented in many myths, such as in the myth of Prometheus and the fire, at the end of the Odyssey, and in the Epic of Gilgamesh. As a symbol of resurrection, rebirth and enlightenment, the tree is the Cross of Christian theology or the Tree of Awakening of the Buddha. the symbol «is able to reveal a perspective in which heterogeneous realities are susceptible of articulation into a whole, or even of integration into a "system". [...] the religious symbol allows man to discover a certain unity of the World, and, at the same time, to disclose to himself his proper destiny as an integrating part of the World. [...] The religious symbol not only unveils a structure of reality or a dimension of existence; by the same stroke it brings a meaning into human existence». These symbols allow humans to grasp the mystery of existence as a constant theme of death and rebirth, simultaneously signifying the original act of creation out of chaos. Myths and rites, as figurative stories and practices of the manifestation of the Absolute and its modalities (archetypes), are eternally true. The Absolute has been known by different names and conceptions in all the major religious cultures of the world, both historically and contemporarily. It was called Anu or Dingir among the Sumerians; Amun ("The Hidden") or Netjer in the theology of Ancient Egypt; *Dyeus Phiter ("Luminous Creator") among the early Indo-Europeans and later as Deus Pater, Deus Ignotus ("Unknowable God") or Deus Incognitus ("Unconceivable God") in the theology of Ancient Rome and other Indo-European branches; Zeus or Deos in Greek religion, and as an abstract concept the Arche (Origin), to En (the One) or the Monad in Hellenistic philosophy. The Absolute is known as Teotl or Hunab Ku in native Mesoamerican religion, the Great Spirit in native North American religions. In Chinese religions, Confucianism and Taoism the Absolute is called respectively Taidi ("Great Energy"), Tian and Tao as the Wuji. In Hinduism the Absolute is called Parabrahman or Brahman, while in some Buddhist religions it has been conceptualised as Adibuddha. In Japanese Shinto and Korean Muism it is called respectively Amenominakanushi (and Kannagara is its manifestation or the order of nature) and Haneullim. The Absolute is known as Ein Sof in Jewish philosophy or Kabbalah; Allah in Arabic-speaking cultures and Islam and specifically Al-Haqq in Sufism. In Western Christian countries the names of the Absolute are generally variants of the Germanic word "God" or the Latin Deus. In the Yazdani faiths, Yazdān ("Divine") defines the Absolute. The Germanic word *Gudan, from which English "God" derives, is a variant of *Wodanaz (Odin), and both come from Indo-European roots all meaning "energy" (inner urging), "spirit", "creation", "invoking" (inner calling). The Absolute is revealed in the Slavic native faith as the Rod, meaning "Root", "Origin", "Genus". The human vital essence - soul, spirit, spark of awareness, is said to have originally derived in each case from the Absolute and to be indestructible after the nature of the Absolute, and to be capable of returning to it. The general commonalities between the various versions of the Absolute are: infinity, indescribability, formlessness, transcendence and immanence. An additional commonality is that man must renounce and/or transcend physical existence and its distractions, in some cases even to the point of extinguishing identity and individual awareness, in order to understand or co-exist with the Absolute. Uniformly, human passions and vices are regarded as barriers to spiritual advancement, and such virtues as humility, charity and righteousness are felt to help pave the way to enlightenment. Hegel, Schelling, and their followers; it is associated with various forms of philosophical idealism. The Absolute, either under that name, or as the "Ground of Being", or some similar concept, also figures in several of the attempted proofs of the existence of God, particularly the ontological argument and the cosmological argument. In scholastic philosophy the Absolute was regarded as Pure Act, unadulterated with remaining potential. The concept was adopted into neo-Hegelian British idealism (though without Hegel's complex logical and dialectical apparatus), where it received an almost mystical exposition at the hands of F.H. Bradley. Bradley (followed by others including Timothy L.S. Sprigge) conceived the Absolute as a single all-encompassing experience, rather along the lines of Shankara and Advaita Vedanta. Likewise, Josiah Royce in the United States conceived the Absolute as a unitary Knower Whose experience constitutes what we know as the "external" world. However, the concept need not be taken to imply a universal unitary consciousness. American philosopher Brand Blanshard, for example, conceived the Absolute as a single overarching intelligible system but declined to characterize it in terms of consciousness or experience. From a Buddhist perspective, there is no text in which the Buddha explicitly argues that the universe lacks an essence; he instead critiques positions regarding an ultimate nature of reality — such as those found in the Upanishads — in the manner of later Prasangikas. The Buddha of the early texts does speak of experiencing "luminous consciousness" beyond the six sense media. Passages in which the Buddha criticizes those who talk about things not amenable to experience are quite common in the early texts. Nagarjuna, one of the most prominent philosophers of Mahayana Buddhism, was considered by early scholarship as propounding an absolutist doctrine with his development of the Buddhist concept of śūnyatā ("emptiness", "void" or "openness"). This is criticized by many modern scholars as incorrect and not grounded on textual evidence. The consensus is that Nagarjuna defended the classical Buddhist emphasis on phenomena. For him śūnyatā is explicitly used as a middle way between eternalism and nihilism, and that is where its soteriological power lies. It does not refer specifically to an ultimate, universal, or absolute nature of reality. Holding up emptiness as an absolute or ultimate truth without reference to that which is empty is the last thing either the Buddha or Nagarjuna would advocate. Nagarjuna criticized those who conceptualized śūnyatā: "The Victorious Ones have announced that emptiness is the relinquishing of all views. Those who are possessed of the view of emptiness are said to be incorrigible." By contrast, many schools of Mahayana Buddhism, particularly those in alignment with the Tathagatagarbha scriptures, affirmed some notions regarding a positive absolute, identifying it with the true or original substance or Self of the Buddha. Kant questioned whether the absolute can be thought. Nietzsche criticized Hegel's claims about the non-relative Absolute. The mathematician Absolute Infinite with God. 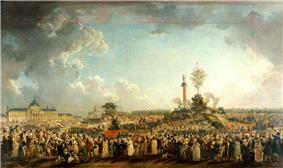 Festival of the Supreme Being, 8 June 1794 Paris. The noumenon is a posited object or event that is known (if at all) without the use of the senses. However, rather than distinguishing from the relative, the thing in itself is used to distinguish an actual object from phenomenon (the appearance of things-in-themselves to the senses). ^ «il grafema rappresenta un punto da cui si irradiano delle linee in otto direzioni dello spazio (ovvero: le bisettrici dei quattro punti angoli del mondo): esso è quindi da riferire al concetto studiato da Eliade e indicato con l'espressione "ombelico del mondo", ovvero il concetto di un centro di irradiazione da cui scaturisce una realtà, così come il feto si forma attorno all'ombelico [...]. I significati "spiga", "grappolo" per il grafema AN corroborano questa interpretazione: infatti le spighe e il grappolo di datteri si dipartono rispettivamente dallo stelo e dal picciolo in maniera analoga al feto dell'ombelico (ovvero come appare il neonato rispetto al cordone ombelicale). [...] An era concepito come realtà divina celeste che costituiva la fonte, il principio delle divinità». ^ «Da quanto precede risulta che il "vero mondo" è sempre nel "mezzo", al "Centro", cioè sul punto di rottura del livello, e di comunicazione tra zone cosmiche. [...] Ci sembra quindi di dover concludere che l'uomo delle società premoderne aspira a vivere il più possibile al Centro del Mondo». ^ Dadosky, 2004. p. 85, quoting Mircea Eliade. ^ Richard Gombrich, How Buddhism began: the Conditioned Genesis of the Early Teachings. Continuum International Publishing Group, 1996, page 34. ^ Brahma-nimantanika Sutta, translation and commentary by Thanissaro Bhikkhu: . ^ Chandra, Pratap (July 1971). "Was Early Buddhism Influenced by the Upanisads?". Philosophy East and West 21 (3): 317–24. ^ Jorge Noguera Ferrer, Revisioning Transpersonal Theory: A Participatory Vision of Human Spirituality. SUNY Press, 2002, page 102. ^ Jorge Noguera Ferrer, Revisioning Transpersonal Theory: A Participatory Vision of Human Spirituality. SUNY Press, 2002, pages 102-103. ^ David J. Kalupahana, Nagarjuna: The Philosophy of the Middle Way. SUNY Press, 1986, page 49. ^ §3.2, Ignacio Jané (May 1995). "The role of the absolute infinite in Cantor's conception of set". Erkenntnis 42 (3): 375–402. ^ "1. intellectual conception of a thing as it is in itself, not as it is known through perception" "2. The of itself unknown and unknowable rational object, or thing in itself, which is distinguished from the phenomenon through which it is apprehended by the senses, and by which it is interpreted and understood; -- so used in the philosophy of Kant and his followers."